HRA Cloud's Training and Qualification tools allows businesses to track, record and report on training, qualifications, skills, competencies, licenses and compliance requirements. HRA Cloud's Training & Qualification module is powered by HRA Cloud's Self Service portal which means that your candidates, employees, contractors and volunteers can log into their own Self Service account in order to assign, update and track their competencies, training and qualification requirements without having to disrupt the Human Resources department. Setting up the Training & Qualifications module is simple and straightforward involving the following easy steps. You will first need to ensure that core HRA Cloud has been set up. HRA Cloud's Training & Qualifications module is powered by Self Service. To ensure optimisation and efficiency, Self Service needs to have been set up and launched across your organisation. This step can be done either before or after the Training & Qualifications module has been set up as per the below steps. The HR department (or the relevant manager) will need to set up the Training & Qualification module via the Administration area within core HRA Cloud. You will need to ensure that the relevant user has the correct user access permissions. The relevant user will need to be assigned the "AccountAdmin'' role or the ''TrainingManagement'' role. 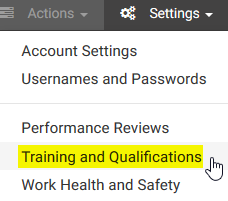 To access the "Training and Qualification Administration" page, go to ''Settings'' and select ''Training and Qualifications’'. Once you are in the Administration area, you can create the required competencies and roles that your business is seeking to track, record and report on for compliance purposes. The Manager will need to create a comprehensive library of competencies that are relevant to your organisation. Competencies can be used to track a broad range of function and role requirements such as the need to attend regular training courses or to ensure that the relevant qualifications, licenses and certificates are always up-to-date for example. To create a new competency, go to the "Competency" tab, select the ''New Competency'' button and complete the relevant fields. Competencies can be created individually or in bulk. - How to create new competencies? The Manager will then need to create a selection of roles to reflect your business’ different job types and functions. Roles are used to group a number of competencies together that are all relevant to a specific role or function. For example, if you have a sales team that all require the same competencies, you can create a role called ‘Sales’ and assign the respective competencies to that role. Relevant competencies for that role type might include a Sales Qualification and Drivers License for example. To create a new role, go to the "Roles" tab, select the ''New Role'' button and complete the relevant fields. Roles can be created individually or in bulk. The relevant competencies (as created in Step 2) can easily be assigned to the role via a 'drag and drop' process. - How to create new competency roles? The Manager will now need to assign the relevant roles and/or competencies to the relevant worker records (candidates, employees, contractors and/or volunteers). - How to assign roles and competencies to worker records? The final step requires each competency that has been assigned against a worker record to be updated to reflect the status and details of each skill, training and qualification requirement. All documentation, data and expiry dates tracked against competencies is stored against the worker’s file. This is the most important step of the set-up process as it ensures compliance and will trigger a range of alerts for any competencies that have expiry dates for example. The Manager can complete this process in bulk however it is recommended that it is done individually to ensure the quality and integrity of the data. Alternatively, you can require your workers (candidates, employees, contractors and/or volunteers) to update these details themselves via their Self Service portal. - How to update competencies with the relevant details via core HRA Cloud? - How can workers update competency details via Self Service? The set up process is now complete and ready to use. Going forward, your Managers can update the training and qualification details at any stage of your worker’s life-cycle. Your candidates, employees, contractors and volunteers can also update their details via their Self Service accounts. Contact HR Assured's Client Experience team for assistance. What is the activation process for an eSS User via a checklist task?